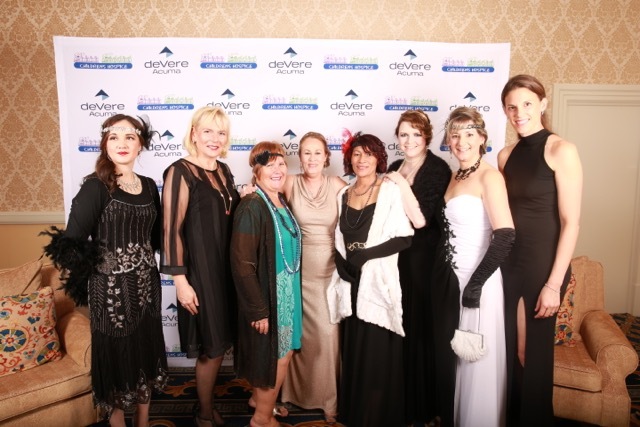 On the 27th of August, Iris House with sponsor de Vere Acuma hosted their fifth annual Grand Ball; The spectacular Gatsby themed annual fundraiser ball held at the Table Bay Hotel was a huge success and raised R220 000 for much-needed running costs for our free hospice and community based care. Our MC Danilo Acquisto and Auctioneer Stef Olivier provided much laughter and excitement. Our highest bid of the evening was R31 000 00 was for an exclusive dinning experience with Premier Helen Zille for up to six people at her beautiful home Leeuwenhof with wines supplied by Groot Constantia. We were privileged to have the leader of the official opposition party of South Africa, Mr Mmusi Maimane as our guest speaker (view his full speech here). As well as several other VIP guests including Minister Alan Winde, The FW de Klerk Foundation, Jan Braai, Kevin Vermark, Doctor Darren Green and Barbara Lennard. After enjoying a five-star meal, speeches, can can dancers, Charleston dancers and auction. Our guest took to the dance floor to enjoy the singing sensation, Jimmy Nevis. Congratulations to Kerrith and Simone of Boutique Styling on successfully planning and running their first Iris House ball, it was incredible. Next years Ball has a Crystal theme and promises to be even better, with a new entertainment line-up and some exciting surprises. It takes place on the 26th of August 2017. Tickets cost R1500 per person. A package including accommodation at the Table Bay Hotel is also available. There are only 160 seats so booking early is advised.